Loves & Dislikes, changes to the Editing State and various other feature requests have been implemented. When I was first asked to implement iTunes Loves & Dislikes I quite frankly couldn’t see the need for them. However, at some point I realized that the numerous approaches taken by applications to interpret Ratings, at times makes them almost meaningless. I also realized that setting proper ratings is a lot of work. Quantifying the degree to which you like a recording can be daunting. Looking over my collection, I found that most tracks where I had set ratings, had five stars. So… basically I was implementing Loves via the rating system. Moving on I found a few tracks where I used one star on music I really didn’t appreciate. Again, one star didn’t really describe what I was after. I didn’t “like it a little”….I disliked it. I wrote a small action, which I ran through the Batch Processor, to automatically set Loves and Dislikes based on five stars or one star. So while I personally don’t use iTunes to view my collection I’ve been sold. 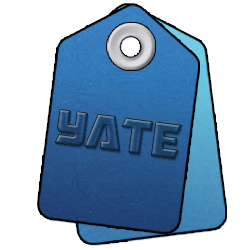 The next release will have changes to make fields which display well graphically, configurable in Yate databases….. where I typically view my collection. Thanks for the feature requests and especially to those kind people who tested and provided feedback on the release.